Thanks to Andy Blackwell for the opportunity to revisit my childhood (I seem to be doing this a lot lately!) 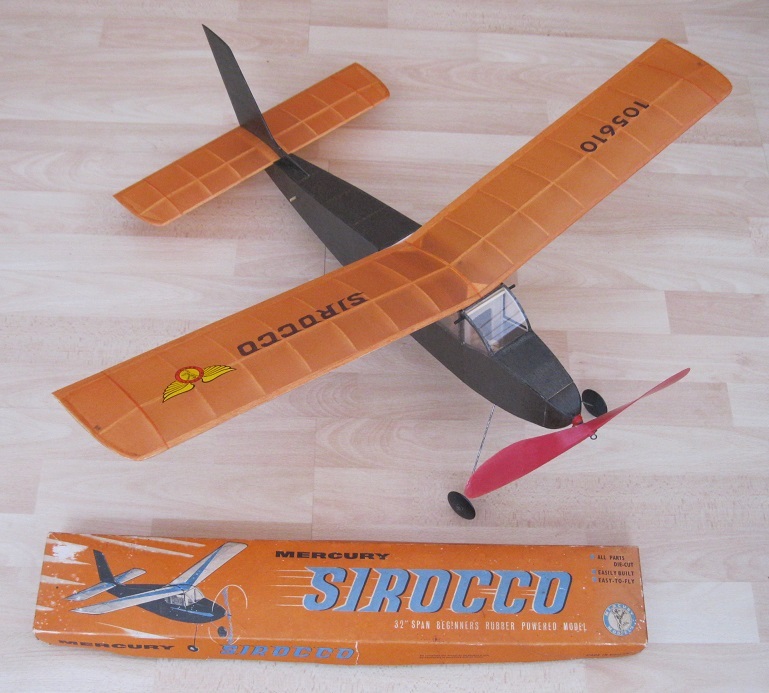 and build a Mercury Sirocco - another model I remember building with my dad. Not an easy kit to track down and I've never seen a plan on the web, so you can imagine my delight when Andy presented me with an original kit and suggested I build it. Before I started I scanned all the die cut parts sheets, and Andrew Darby kindly scanned the plan as a single sheet pdf. After importing the part scans into Autocad, I traced them and saved as pdfs to download and print onto either A4 or A3 paper. Follow the links at the bottom to get them. I used all the kit sheet wood, and some of the stripwood provided, but replaced the 1/8" square strip as it had gone a bit brittle. Some of the 1/8" sheet suffered from some die crushing, but on the other hand it wasn't too heavy, so I just cleaned up the edges afterwards as well as I could. As you can see the structure is pretty robust, but as it was designed as a beginners model, maybe that's no bad thing. Construction was straighforward, and the design well thought out. I used the pre-bent undercarriage with attached Keil Kraft steamlined wheels - also the big plastic Keil Kraft prop. 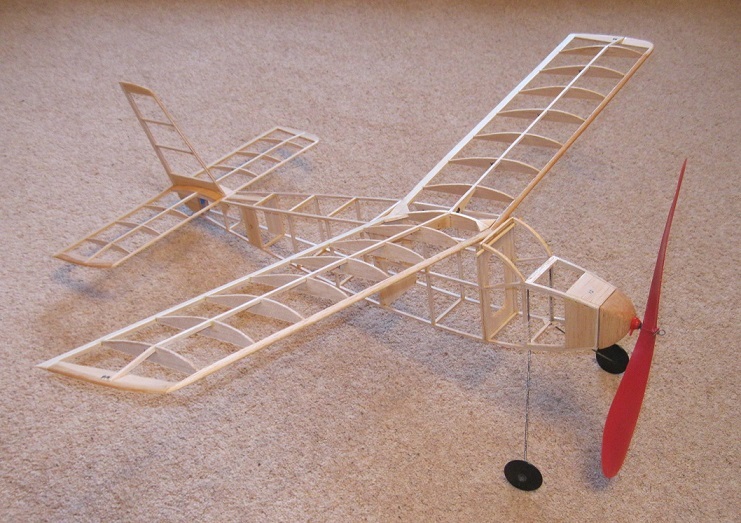 I know a balsa prop would be more efficient, but I wasn't going to be looking for competition performance. Plus I thought a heavy prop might be beneficial due to the relatively short nose. The little red tag you can see on the prop bushing is used to adjust the thrust angle, as the seat of the bush has an angle moulded into it. I covered the model in Esaki tissue - what a luxury not to have to get the airbrush out. Wing lettering/numbering was cut from tissue and doped into position. The Mercury badge on the wing was one of the original kit decals, coated with Microscale liquid decal before soaking, in case it disintegrated. Power on the plan is quoted as 3 loops of 1/4", but I used 4 loops of 3/16" on the basis that this would be easier to braid. First glides in the garden looked a touch steep, so I shimmed the back of the tailplane by 1/16", which looked better. First flights were at the marvellous September meeting at Old Warden (2014) where the highest wind speed we saw all weekend was 5 mph. Basically I just wound it up, and off it flew - no adjustments needed at all, I was lucky it had a natural right turn, so didn't even have to bother with the fin trim tab. The most winds I dared put on was 600 because I was worried about it flying off the field - I need to take it to Middle Wallop and really wind it up. To conclude - if Brian Lewis's brief was to design a foolproof beginers rubber model, he certainly succeeded - it's a simple build and trimmed out ridiculously easily. He also designed a smaller 24" span version called the Mistral (the Sirocco is 32"), which I also have the plan for. I think that will also get built before too long. The pdf parts files will print out full size if you set the zoom to 100% or "none". If you print onto A4 paper, I have allowed a very large overlap so no single part will be split between the sheets. The plan can be tiled onto A4 or A3 sheets using Acrobat Reader version X or higher. 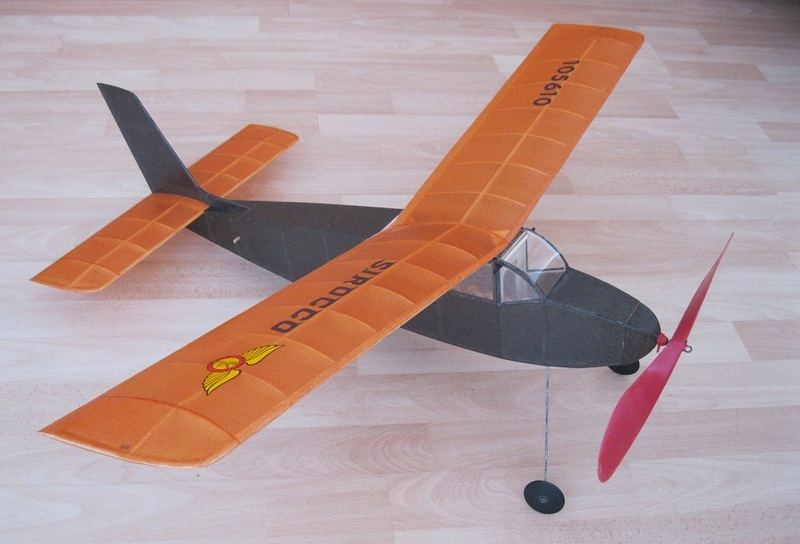 If you build one, let me know how it flies and send me picture for the web site!